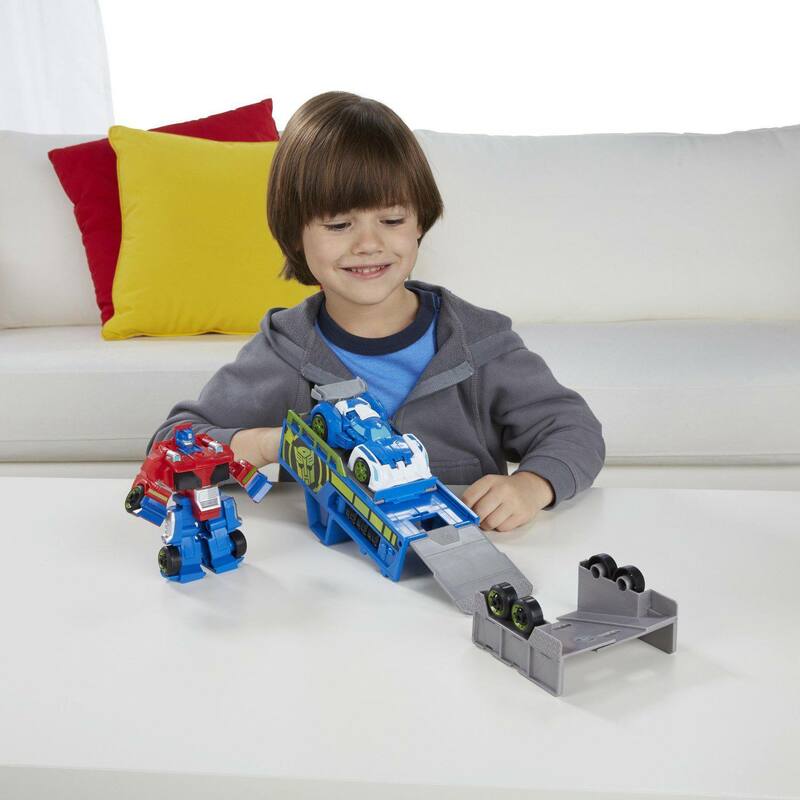 "The trailer converts into a vehicle launcher and there are also ramps...The set includes 2 transforming figures, Optimus Prime and Blurr.."
"Just like kids like collecting Hot Wheels cars...they will also want to collect all of the Transformers Rescue Bots." "Includes projectile launchers, vehicle launchers, a helipad and a motorcycle." "This large transforming character is 13 inches tall...the toy speaks phrases and makes sounds, too." "Similar to the Robots in Disguise Optimus Prime. The toy arrives with a Buzzstrike Mini-con weaponized figure." "The Fortress Maxiumus figure transforms into a robot, a battle station, and a city...it is 2 feet tall and very large." "This unique toy was designed by Transformers fans who voted on features through the Transformers app." For little kids who love Optimus Prime, they will enjoy this fun racing trailer. The trailer converts into a vehicle launcher and there are also ramps for the Transformers to drive on. The set includes 2 transforming figures, Optimus Prime and Blurr. 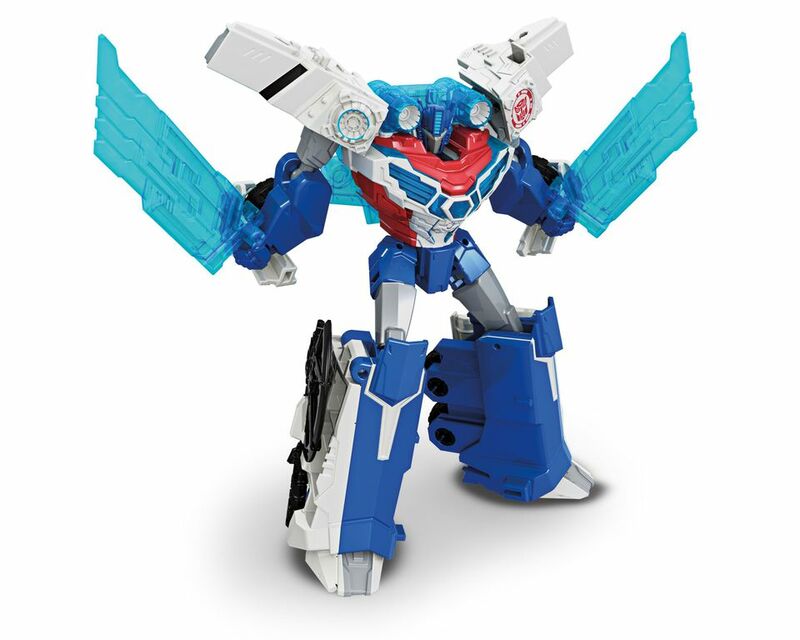 Just like kids like collecting Hot Wheels cars and other action figure characters, they will also want to collect all of the Transformers Rescue Bots characters, too. Some character action figures in this set from the show include Boulder, Quick Shadow, Medix, Chase the Police Bot, Hoist the Tow Bot, Morbot, Blades and Bumblebee. The Griffin Rock Firehouse Headquarters is a place for children to use their Transformers Rescue Bots characters to plan their missions against the Decepticons. The toy includes projectile launchers, vehicle launchers, a helipad and a motorcycle. The Power Surge Optimus Prime toy is recommended for older Transformers fans who are 5 and up. This large transforming character is 13 inches tall. This toy also arrives with a smaller mini-con figure which can attach to the larger toy. Given that it requires batteries the toy speaks phrases and makes sounds, too. Power surge Bumblebee is similar to the Robots in Disguise Optimus Prime. The toy arrives with a Buzzstrike Mini-con weaponized figure. There are also Transformers Generation toys, which are classic Transformers that are re-released each year with new features and accessories. Given that this collectible toy retails for close to $150, it is definitely for a real Transformers fan. The Fortress Maxiumus figure transforms into a robot, a battle station, and a city. As a figure it is 2 feet tall and very large. This unique toy was designed by Transformers fans who voted on features through the Transformers app. The Combiner has special powers. Combiner wars allow Autobots and Decepticons to combine forces and create a large super-robot. This toy comes with 5 accessories, a poster, and a Victorion character card.